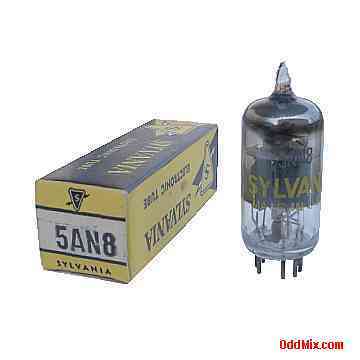 This is an original, discontinued type Sylvania 5AN8 Medium-Mu Triode Sharp-Cutoff Pentode electronic tube. The 5AN8 was developed for color television applications. The pentode part applications included IF, video, AGC amplifier or reactance tube. The triode side was designed to be used for low-frequency oscillator, sync-separator, sync-clipper or phase-splitter circuits. Excellent for replacement, antique radio, instrument, TV television restoration projects, experimentation, circuit research or to set up a private vacuum tube museum. It is new, unused, boxed, excellent condition. First come first serve, only one available!